On a theoretical level, the minimalist life sounds like a fantasy. No excessive "stuff" that requires maintenance, cleaning, upgrades, or insurance. A beautiful home, a capsule wardrobe, and effortless travel thanks to your exquisitely packed (and tastefully matching) cabin-only baggage. Then a quick scan of home brings you abruptly back to Earth. If the "crap basket" was designed for anyone, it was my family. You know the one — it lives on the stairs, or a dresser, accumulating detritus until someone blinks and trashes the lot. But in my case, simply getting to the trashcan requires you to pick your way through discarded Lego bricks, turn a blind eye to the dumped homework pages curling in the sun, and ignore (or marvel at) the variety of clothing that has been shed on the porch. Minimalists we are not. But I can dream of better days, and start to practice a little now. And even if you're not in such a crisis — wouldn't it be great if you could slim down your stuff without missing it? 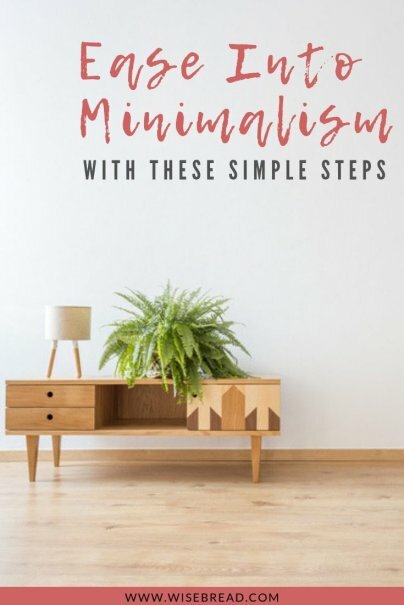 Without stating the obvious, it's a lot easier to be minimalist if you have less stuff to start off with. If you live in a house with kids who love brightly colored plastic, and a techie-geek early adopter, then this can be a challenge. But changing your thinking about acquiring stuff is a start. After all, how much of the stuff that came into your home in the last six months still gives you pleasure, and how much is a burden? "A once-cherished Walkman is now obsolete, but, as Humphrey Bogart once told Ingrid Bergman, "We'll always have Paris."" Switch your mindset about buying new things — and if you're up to it, go one step further. What if you cashed in your clutter and made the money work for you instead? Take a quick spin on eBay, and reinvest the cash you earn in a shared experience instead of an upgraded gadget. If you find yourself moving at lightning speed when the urge to splurge hits, then before you know it, you're weighed down with new purchases. Help yourself by slowing down the decision-making process. Some things you really need. Most things you simply want — but many of us don't even register the difference. We are trained to feel like a new purchase should be ours because we deserve it. Advertising makes consumption normal, whether or not we actually need to buy more stuff, and at a subconscious level we come to expect certain things. Maybe it's buying a new winter coat every season, even though the last one barely saw the light of day. Perhaps you find yourself drawn by an inexorable force to the new iPhone, despite there being little to pick it apart from the one in your pocket. Once you're on it, it's hard to backpedal — after all, you work hard for this, should you not allow yourself a little treat? Force time to think about the things you buy. One useful thought exercise can be to ask whether you would like the immediate purchase as much if you compare it to the potential lifetime return the cash could bring you. So, if you assume a modest 5% interest rate if you invested the money in your pocket, you could have the $1,000 bag today, or you could have the $1,000 pay you $50 every year of your life (and still have the capital there if you ever did decide the handbag was a life or death necessity). And if all else fails, encase your cards in ice and you're forced to wait until they defrost before you go on a spree. When it comes to avoiding the temptation to accumulate more stuff, there is some very old school, tried and tested advice. Shop online (with a plan), and don't hang out in malls, and you are well on the way. But the rise of the sharing economy is good news for wannabe minimalists. There are some gadgets, or hardware items, that we need once in awhile that can seem essential to every household — but now you can also consider whether you can borrow or rent things before leaping into a purchase. If you're considering a purchase, renting can be a great way to "try before you buy," and you can even make the most of your own seldom used stuff by renting it out for a profit rather than having it sitting about ruining your minimalist ambitions. This might seem like counterintuitive advice if you want to live a sleek and simple life, but the worst thing you can do is organize. Step away from the additional shelving, and dump stuff instead! The very thought of trashing those keepsakes might have put you into a tailspin. That's normal — we all have a little bit of the hoarder inside. To make this work, you need a friend to supervise so you don't cop out — and a steely resolve. But removing the need to build yet more flat pack storage units is its own reward. If sentimental keepsakes are your downfall, digitize what you can, and go about writing your personal story in a way that honors memories without bogging you down. Through the process, you will identify what is actually meaningful to you, and what you can let go. I have a long way to go before I can take any minimalist honors. For now, I will have to satisfy myself with having a clear path through the shoes, Wellington boots, skateboards, and soccer balls in the hallway. But I can dream, and with these small tweaks, I might just get there one day. What about you? Is your home organized minimalist chic, or crap magnet? Tell us in the comments! 5% interest - a modest rate! tell me where I can get that nowadays, I haven't been getting returns like that for years.